Five years later, the popular Canadian artist returns with a song about how she turned to God during “the battle of my life” against Lyme disease. Five year after her last release, popular Canadian pop artist Avril Lavigne presented the first single of her new album “AL6”. “Head Above Water” had 7 million views on Youtube in its first 48 hours. The song is a prayer to God in the midst of the “battle of my life” with Lyme disease. It was back in 2015 when the artist revealed she suffered from this infection caused by tick bites, and since then she has been raising awareness about how to prevent it. 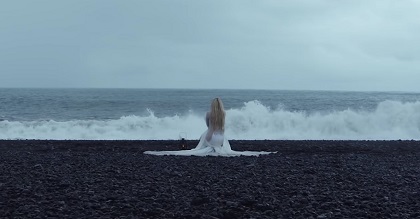 In a video shot by the shores of an ocean, Lavigne sings about her “spiritual experience”, which resembles that of Peter stepping out of the boat to reach Jesus in the middst of a storm (Matthew 14). “God, keep my head above water”, Lavigne sings. “Don’t let me drown, it gets harder”. Promotional image of Avril Lavigne's new album. While she sings about her struggles, Avril describes the hope of a future encounter with God: “I’ll meet you there at the altar, as I fall down on my knees”. This has also clear Biblical resonances (Romans 14:11). In a statement, the artist explained her personal journey. “One night, I thought I was dying, and I had accepted that I was going to die. My mom laid with me in bed and held me. I felt like I was drowning. Under my breath, I prayed ‘God, please help to keep my head above the water’. In that moment, the song writing of this album began. It was like I tapped into something. It was a very spiritual experience. Lyrics flooded through me from that point on”. After visiting many doctors, Lavigne was diagnosed in 2014. She was “in bed for the better part of two years”, and only started to recover in 2017. “AL6” is Avril Lavigne’s sixth album since 2002. She has so far sold 50 million album and 60 million singles with songs like “Sk8ter boy”, “When you’re gone” or “Complicated”.